On two occasions in the past year, both in May 17th and November 21st 2017 we had the opportunity to host Seattle-based e-textiles pioneer, designer, artist, creative technologist, entrepreneur and writer - Maggie Orth for a guest talk on her work. DXARTS Assistant Professor Afroditi Psarra, PhD, participated at Eyeo Festival with a lecture and a workshop on June 29th, at 10:30am. The festival was held at the Walker Art Center in Minneapolis, June 26-29. DXARTS 490B is an introductory course to electronic textiles, soft-circuits and wearable technology. 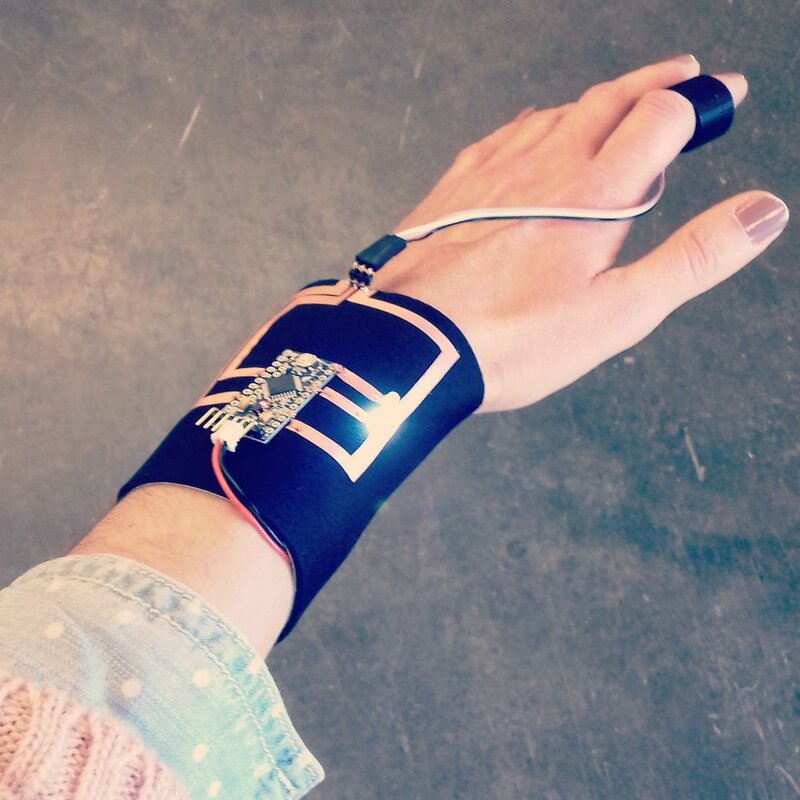 It provides hands-on prototyping for physical computing projects that explore the body as an interface of control for interactive environments. The students engage with smart materials, hand-crafted electronics and creative programming with Arduino to design their own interactive wearables. E-textiles and wearable computing can be used in multimedia performance projects, interface or game design, medical monitoring systems, and also as educational tools for people of all ages. On May 2017, in the context of DXARTS 490B: E-textiles & Wearables for Art & Design, we had the opportunity to host a guest lecture and a mini-workshop with e-textiles practitioner, researcher and independent art curator, Tincuta Heinzel. The lecture was supported by the OLF Lectures Program of Fulbright Commission. On April 2017, the DXARTS softLab had the opportunity to host e-textiles practitioner Hannah Perner-Wilson from Kobakant for a guest lecture on her work and a mini-workshop entitled Transparent and Dangerous. On April 2017 Daniela Rosner and the Tactile & Tactical Design (TAT) Lab of HCDE hosted Austrian e-textile designer Irene Posch as an Artist-In-Residency. During her time at the University of Washington Irene Posch presented her work and her collaboration with e-textile designer Ebru Kurbak through the e-textiles research group Stitching Worlds at the University of Applied Arts in Vienna. Irene and Daniela invited the DXARTS 490B: E-textiles & Wearables students to her talk and a hands-on workshop on making e-textile tools.